Dr. Stephany Schlachter, provost of Lewis University in Romeoville, Illinois, received Letters of Affiliation (AFSC) to the Institute of the Brothers of the Christian Schools. The Midwest District honored Schlachter in a ceremony on Lewis University’s campus on September 6, 2014, in the presence of her family, several Lewis University faculty and staff members, and many Brothers, including Midwest District Visitor Brother Larry Schatz, FSC. Schlachter has served as provost of Lewis University since 2001. Previous roles at Lewis University include vice president for mission and planning and vice president for mission and development. 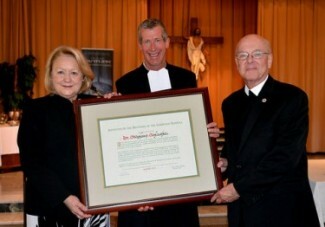 She participated in the Buttimer Institute of Lasallian Studies and has received awards for her work in education. Schlachter is also known as a speaker, author and presenter on various Lasallian topics.